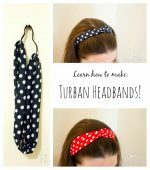 THE FULL TUTORIAL FOR MAKING THESE ADORABLE BABY HEADBANDS IS BELOW, BUT IF YOU DON’T WANT TO MAKE THEM YOURSELF, I’LL MAKE THEM FOR YOU! CHECK OUT THESE BABY FLOWER HEADBANDS IN MY ETSY SHOP! I love making things for babies to wear; they are just so small and cute, and babies look ADORABLE in them! 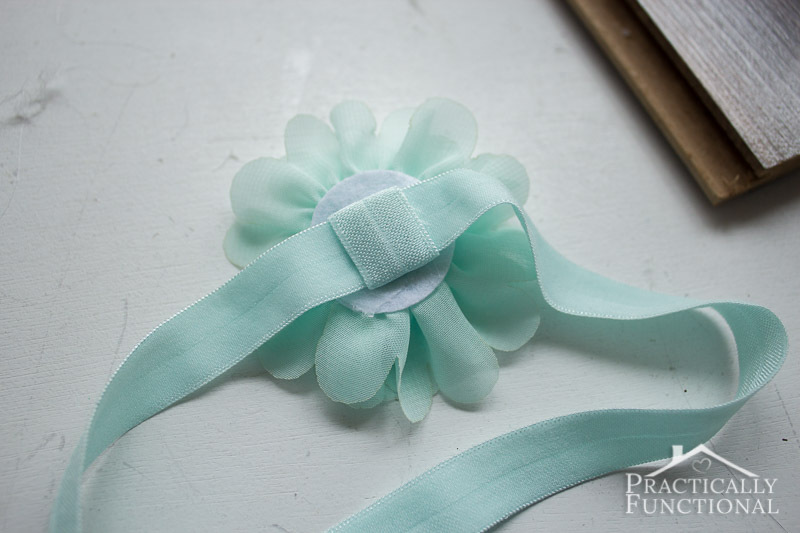 And these DIY no sew baby flower headbands are no exception. 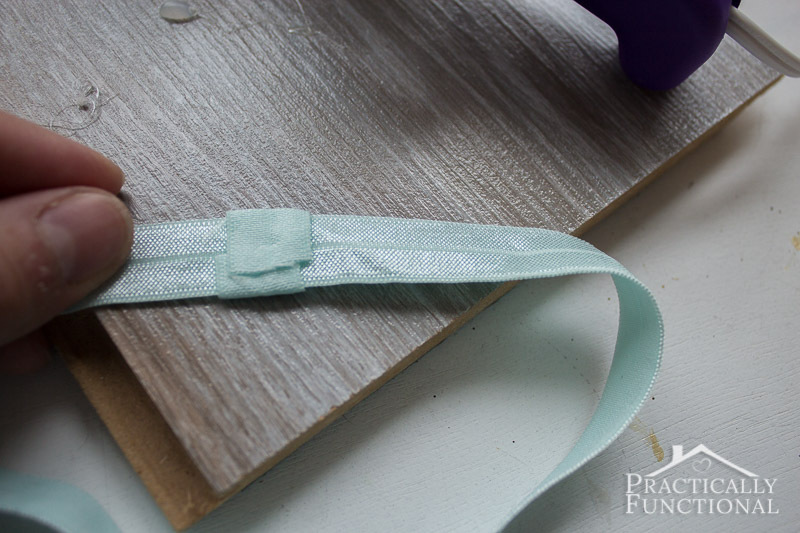 Today I’m going to show you how to make these cute baby headbands for yourself in just a few minutes! 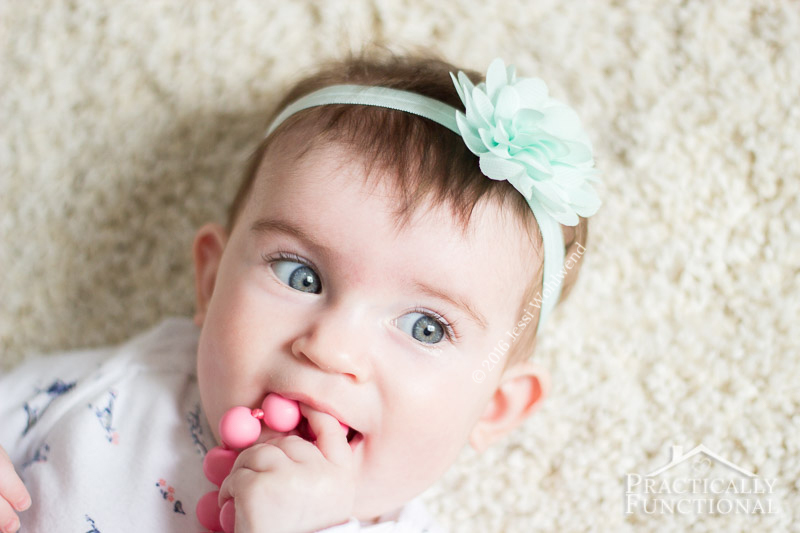 The best part about these cute baby headbands is that they’re so easy to make; there’s nothing to stop you from making one in every color imaginable! I mean, seriously, cut the elastic to size, add a few dollops of hot glue, and you’re done! 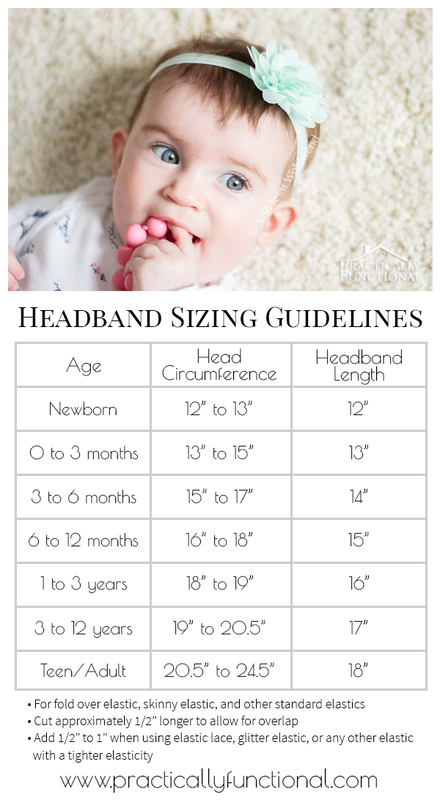 The first thing you need to do is determine the size of your headband. 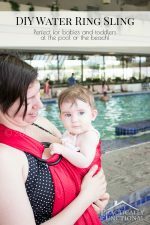 I used 5/8” fold over elastic because it is very soft and stretchy, which is perfect for baby headbands. You can also use skinny elastic or something fun like a lace elastic or glittery elastic. Whatever elastic you use, you want it to stretch just enough to keep the headband on her head and not so much that it’s too tight and leaves a dent. I’ve made a size chart for you so you can determine how much elastic you need. 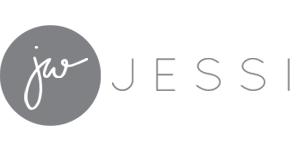 Keep in mind, the lengths listed in this size chart are the final lengths of the headband using fold over elastic, skinny elastic, or any other standard elastic. 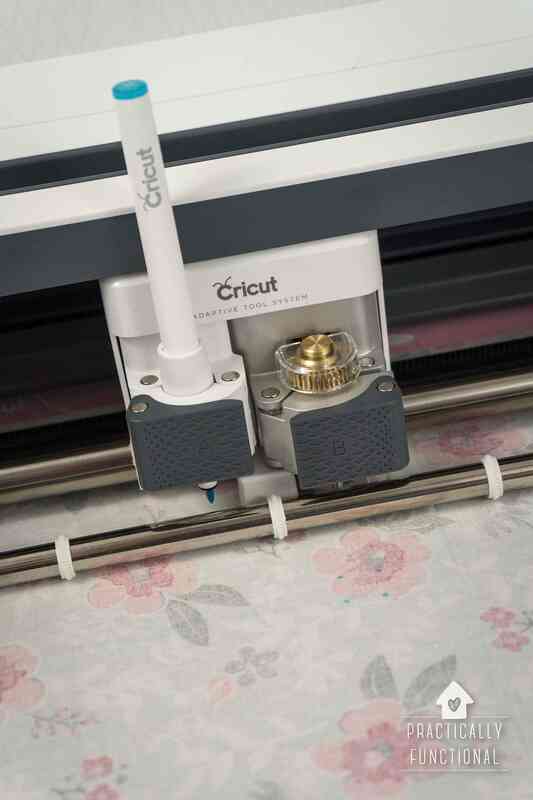 Before you make your cut, add about 1/2” extra so that you can overlap your elastic and glue it together. And if you’re using a “specialty” elastic like lace elastic or glitter elastic, add another 1/2” to 1” to account for the tighter elasticity. Cut your elastic to size using the chart above, remembering to add about 1/2” for overlap. I also cut an additional 1.5” piece of elastic for covering up the overlap. 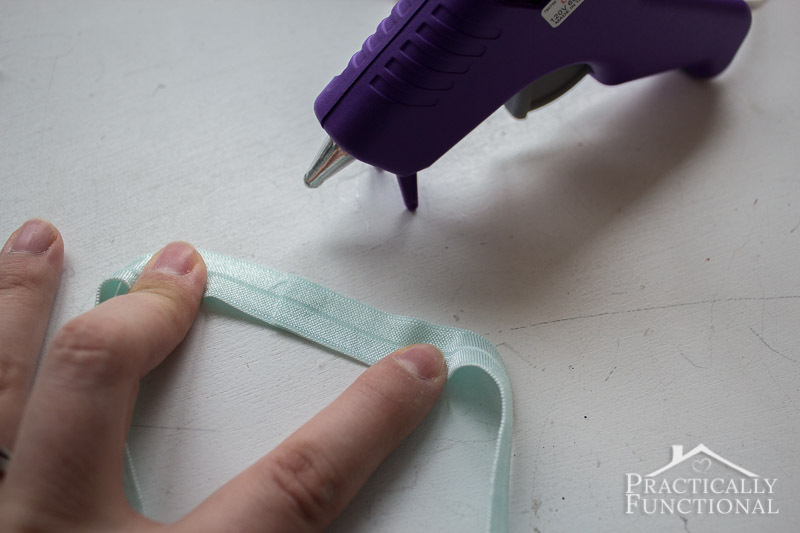 Bring the two ends of the long elastic together, overlapping about 1/2”, and add a small dot of hot glue between the two ends to hold them together. To cover the seam where you glued your headband together, wrap the shorter piece of elastic around the overlap/seam and add a small dollop of hot glue under both ends to hold it down onto the larger piece of elastic. 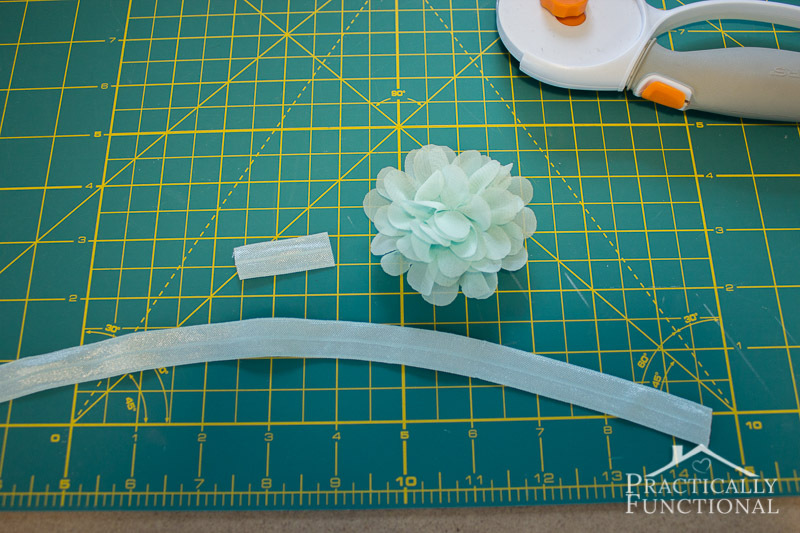 Make sure the overlap/seam of the shorter piece of elastic is on the shiny side of the larger elastic so that it is hidden by the flower later! 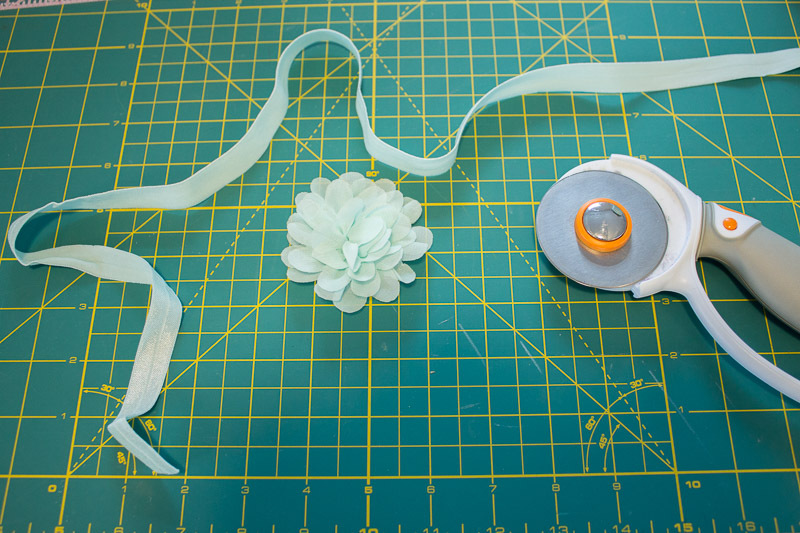 Add a small dollop of hot glue on top of the overlap/seam on the shorter piece of elastic, then stick the back of the fabric flower onto the dot of glue. See how all of the seams are hidden by using that small piece of elastic? It’s such a nice, clean way to finish the headband so there are no weird-looking bits when you’re done. And also, the hot glue is hidden inside the elastic, so only the soft elastic touches your baby’s head and not the hardened glue. Put the headband on a cute baby, stand back, and enjoy! Or wrap it up as a gift for a baby shower! Speaking of baby showers, some of my blogging friends and I have all teamed up to throw a “Virtual Baby Shower” for one of our best blogging buddies, Lauren Lanker of The Thinking Closet! She and her husband, Mark, are expecting their first baby – a precious little girl – this June. Every blogger has contributed something different to our shower, and we have all the elements covered. So grab a cupcake and stay for a while! 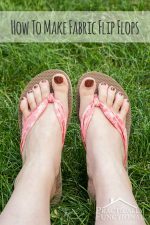 How To Make Fabric Flip Flops For Under $5! 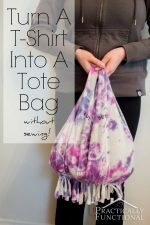 Such a cute and easy gift to make! Oh, this is such a cute project, but that little model is the most adorable part!!! Eek! 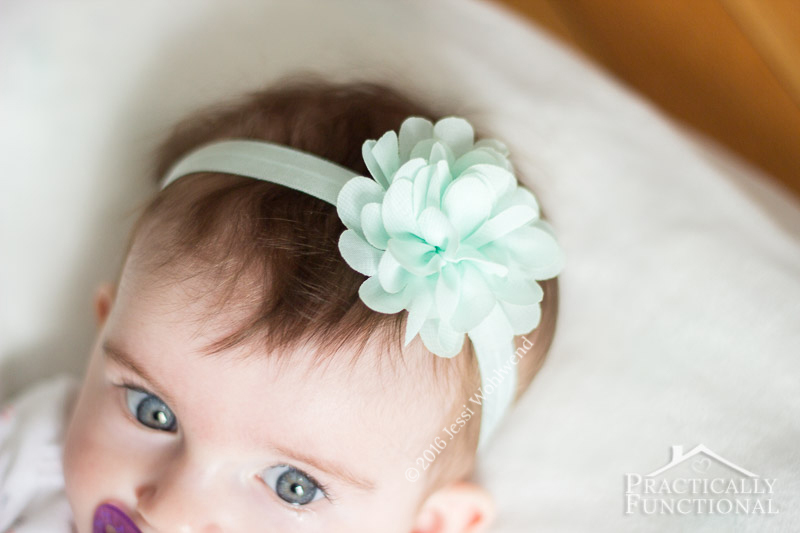 I’m obsessed with all things bow-tastic lately…and this baby flower headband is adorable! Now that I know how do-able it is to pull off, you can bet I’ll be making my own using your awesome blossom tutorial. (Your time breakdown had me cracking up.) Jessi, thanks SO much for being a part of this Virtual Baby Shower today. I’m still soaring on cloud 9! You’re so welcome Lauren! I’m so excited for you and your family, and all the adorable baby crafts you get to do! Adorable! I would have loved some of these in different colors as a shower gift…no mistaking our sweet girl for a boy when she’s sporting one of these lovelies! :^) Thanks for the tutorial. Where do you buy the elastic from? The flowers you used, are they 2 in or 4in? I was hoping you were going to show how to make the flowers! Cute anyway. Ah sorry! I bought those flowers already made. I wish I knew how to make them though, they are super cute!